Ever since Holly could move she has moved along to music. Before she could walk she would sit and swing her body side to side as soon as she heard any music. And the minute she started walking, she started dancing too. This little girl can hear a beat and dance along. At the end of a long day, when I really don’t know how I am going to get to the end of it and I have dinner to cook. To lighten the mood, I put some music on and the girls and I dance in the kitchen as I cook. As they’ve got older, it has led them to go and put on a little dance show together. Which leaves me to get the cooking done. Holly will randomly go and fetch her hand held keyboard and play some music on it shouting ‘look at me mummy, I’m dancing’. There is no doubting that this little lady loves to dance. 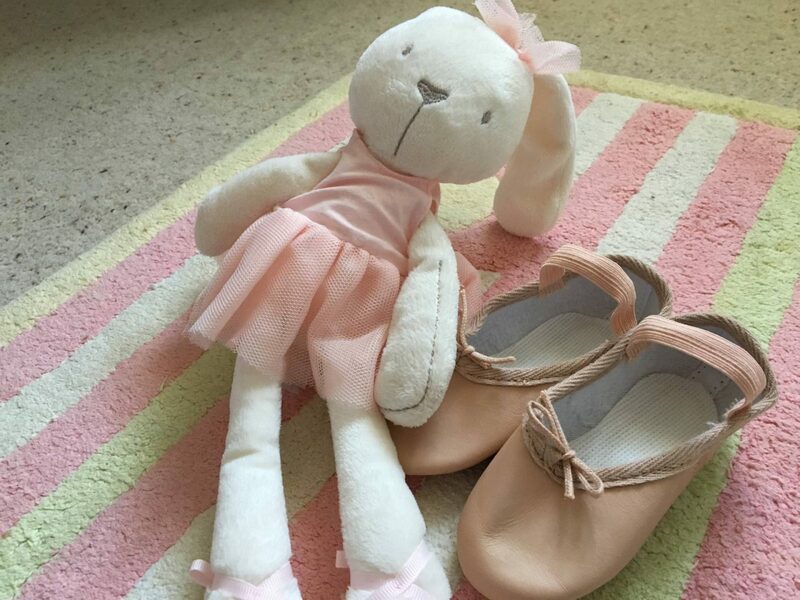 Last week we took a trip into town to get her first pair of ballet shoes, the lady that runs the dance shop is really lovely and so good with the girls. Holly was really excited that on this trip it was her turn to buy some ballet shoes. 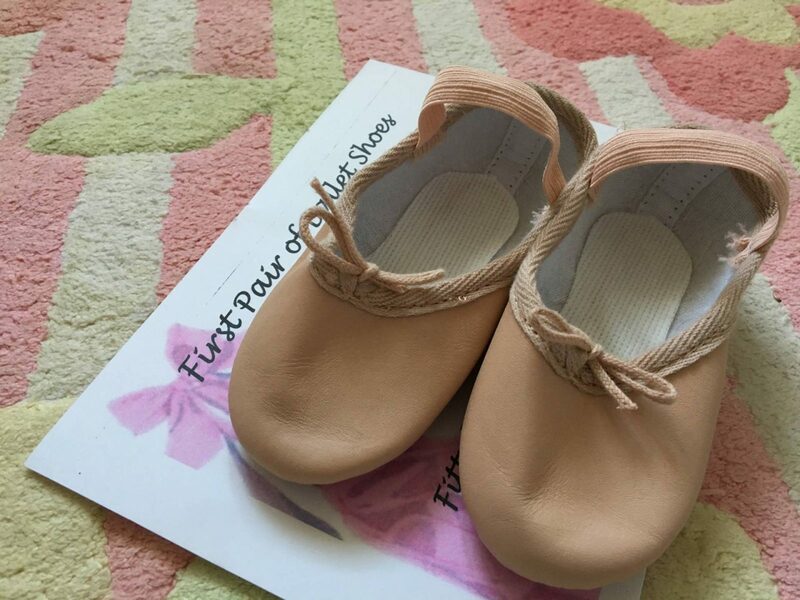 She got her own certificate, ‘My First pair of Ballet Shoes’ and it has her name, date and what size her ballet shoes are. Something to keep in my memory box, along with her ballet shoes once she out grows them. For her birthday a friend of ours brought her a Cath Kidston ruck sack and it has ballerinas on it. I decided to use it as her ballet bag and we popped her shoes in there ready when we got home. She kept looking down at it, I don’t think she could believe she was going to actually be going to ballet classes. 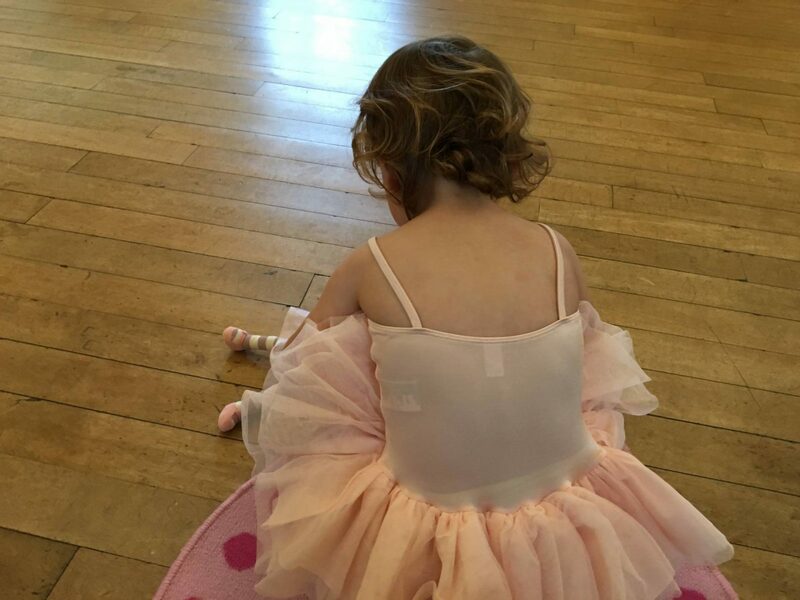 She then spent the next ten minutes running around shouting ‘I go to ballet mummy’. We arrived at the class twenty minutes early because she was so desperate to leave the house! As Alice has been going to ballet classes for a couple of years, Holly recognised her teacher and as soon as she saw her she told her that Alice was at school. I think Holly is really missing her big sister, she talks about Alice being at school all the time. We popped her ballet shoes on and took our place on one of the heart shaped mats. It was so cute seeing all the little ones in their tutu’s. Even though Holly was super excited about going, you never quite know if they are going to actually like it when they get there and take part. When it comes to personality my girls are very different. Alice is a very chatty, confident girl and takes after her Andy, they are both typical Leo’s. Holly’s personality is really starting to show now and she has moments where she is just like me and a bit shy and unsure in certain situations. And then will have moments where she is just like Andy and is loud and confident, normally when she is comfortable in a situation. She started off a bit shy, but happily sat with me and joined in the moves. There was only one time as we were skipping around that she wanted me to carry her. During the lesson the teacher will bring out a box and they all go over and tap the lid. I remember at Alice’s first ballet she didn’t want to do it and with her being more confident than Holly, I was fairly sure that Holly wouldn’t. Well, she proved me wrong and she was of the first to run over and tap the box. Her little face grinning from cheek to cheek as she ran back to me. I was so proud of her. She loved the whole class. But, I think her favourite part was towards the end when they are given a dolly each. Holly loves dolly’s and she will play with them all day long. They loving rock them to sleep and then lay them down and tip toe away. She didn’t need any help from mummy to do it. With Alice now at school, this is the first time that I have had proper one on one time with Holly and I am loving it already. She is at a lovely fun, cute age and I just loved spending this time with her. I did the same class with Alice for a year and then she moved up to the class where they do it on their own. It was lovely to be back doing it all over again with Holly, my little dancer. Our ballet class together, is really going to be something that we are both going to look forward to each week. Awww she is so cute! My little girl didn’t stick in at ballet – now she goes horse riding. A total opposite but she loves it and so long as they enjoy what they do, that’s all that matters. We are huge fans of ‘dance around the house to music a tad too loud’ as the girls really love music. 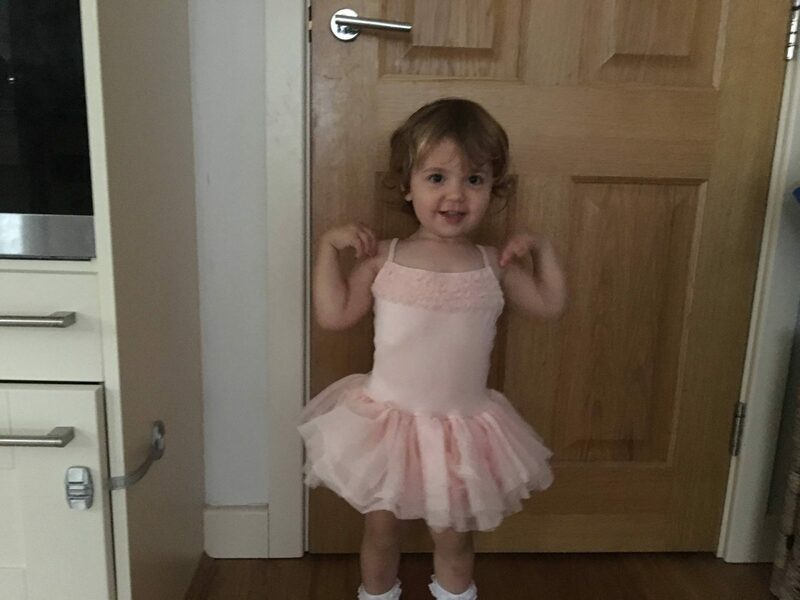 So glad that she loved ballet and she looks so cute in her little outfit! Oh she looks adorable in her tutu. I’m so glad ballet class went well. I’d love to find another class for Lia because the one she used to go to moved to a day we couldn’t do and she’s missing it.